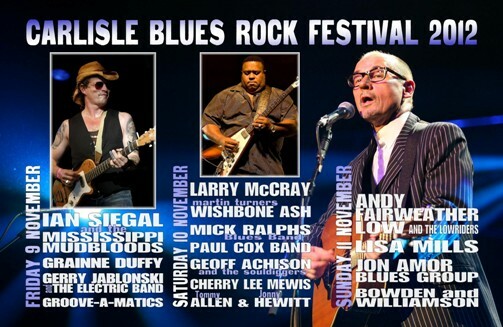 The festival is now firmly established, as one of the major events in the UK Blues calendar! Its reputation is built on the strength of the line up, which gets better year on year and its friendly, intimate environment. It is impressive, that people travel to the event from as far afield as Devon in the South, Inverness in the North and everywhere in between, and even more remarkable, are the journeys of our friends from Holland, Denmark, France, Ireland, and Luxembourg. Taking account of this year’s line up, of bands/artists from across the UK, USA, France, Poland, Ireland and as far away as Australia, we are expecting an even greater international presence! Many regarded last year’s 5th Anniversary festival, as the best blues festival in the UK, and despite this accolade, the line up this year is set to raise the bar, yet again! The fact that Carlisle Blues Festival, has once again been nominated in the best festival category in the British Blues Awards, by a panel of influential authorities on Blues, from all corners of the UK, reaffirms this reputation. This year, we have added “Rock” to the title of the festival; to more accurately reflect the range of music that has been played since 2007 and that will be played this year. In reality, nothing has changed and Blues is still at the heart of the festival; it is, what it says on the tin! The weekend is truly an international affair, and is crammed withsome of the top names from an A-list of Blues and Blues-Rock bands/artists, augmented by one or two up and coming or undiscovered gems! The incredible line up includes LARRY McCRAY USA , IAN SIEGAL & THE MISSISSIPPI MUDBLOODS UK/USA feat, Luther Dickinson, guitarist in The Black Crows, ANDY FAIRWEATHER LOW & THE LOWRIDERS, Martin Turners WISHBONE ASH, MICK RALPHS BLUES BAND (founder member and guitarist of Bad Company & Mott The Hoople), LISA MILLS USA, GEOFF ACHISON & THE SOULDIGGERS AUS/UK, PAUL COX BAND feat Charlie Fabert UK/FRA, JON AMOR BLUES GROUP, GRAINNE DUFFY IRE, CHERRY LEE MEWIS, GERRY JABLONSKI & THE ELECTRIC BAND UK/POL, BOWDEN & WILLIAMSON, TOMMY ALLEN & JOHNY HEWITT and THE GROOVE-A-MATICS. Ticket for full weekend, including two nights’ accommodation breakfast and dinner, in The Swallow Hilltop Hotel – the venue for the weekend, are £187.50 and are selling out fast, so book now to avoid disappointment! !